US President Barack Obama has met Chinese Premier Wen Jiabao on the last day of his much-watched visit to the rising Asian powerhouse. Trade disputes were expected to be on the agenda during Mr Obama's lunch with China's third-highest leader, who is responsible for the economy. Prior to their meeting, the two leaders said the relationship between the two countries was moving forward. Mr Obama is now visiting China's Great Wall, before heading to South Korea. The US president - who is on a week-long tour of East Asia - is expected to focus on North Korea's nuclear ambitions during talks in Seoul. Before Wednesday's meeting with the Chinese prime minister, Mr Obama said the Washington-Beijing relationship was now about more than trade and economics. He said it also covered climate, security and other matters of international concern, the Associated Press news agency reported. Mr Wen was quoted as saying: "We are really on the cusp of moving forward with this relationship." 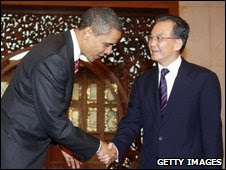 On Tuesday, Mr Obama and President Hu Jintao agreed to co-operate on matters such as climate change and North Korea. Mr Obama said he had also raised human rights issues - including Tibet - during two hours of talks between the pair. Mr Hu said the two nations could discuss such issues "in a spirit of equality... and non-interference in each other's internal affairs". Despite the show of goodwill, correspondents said the issue of trade appeared to be a thorny one between Mr Hu and Mr Obama. Beijing objects to US tariffs on Chinese imports, including steel and tyres. Washington, meanwhile, is concerned by the huge bilateral trade imbalance, and accuses China of keeping its currency weak to make its exports more attractive. Speaking after their meeting, Mr Hu called on the US to "reject protectionism", while Mr Obama urged Beijing to relax controls on the yuan. Both sides acknowledge the need to reduce economic tensions, reports the BBC's Chris Hogg from Beijing, but so far Mr Obama's trip has not produced any breakthroughs. As well as the economy, the issue of North Korea was expected to be discussed in the meeting with the Chinese premier. Both the US and China have been urging the reclusive nation to return to nuclear talks, and last month Mr Wen visited Pyongyang to meet leader Kim Jong-il.